Sold in November 2016, the 33.5 metre motor yacht Cedar Island is back on the market, renamed Exit Strategy and listed for sale by Kristen Klein at Northrop & Johnson. Built in aluminium by US yard Broward, Exit Strategy was delivered in 1994 and has since had many upgrades, most recently in 2018. Accommodation is for eight guests in four cabins consisting of a full-beam master suite, VIP suite, a double and a twin with Pullman berths. All cabins have en-suite bathroom facilities while the master and VIP suites also have television screens. The full-beam main saloon has an L-shaped leather settee to port around a glass-topped coffee table and facing an entertainment centre including a 47-inch flatscreen Sony television and a Boston Acoustics sound system. Forward is a bar, fridge, ice maker and storage cabinets. Further forward still is a country kitchen style galley with an L-shaped settee allowing guests to enjoy casual snacks in comfort in front of a television set suspended from the ceiling. The aft deck has built-in upholstered bench seating, a table and five chairs along with two settees, making this the ideal spot for al fresco breakfasts or evening cocktails. Up on the flybridge of this yacht for sale is a bench helm seat, a large L-shaped settee, a wet bar, fridge, ice maker and a Jenn Air grill. 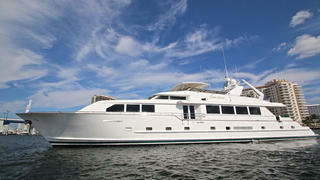 Twin 1,450hp Detroit Diesel engines — rebuilt in 2011 — give her a cruising speed of 17 knots. Exit Strategy is asking $1,100,000.